Those of you curious to learn more about Emma Forrest's reading at the Scent Bar, mentioned in this week's nosy interview post, should hightail it over to Katie Puckrik Smells to read Puckrik's lovely account of the evening's "book/fragrance pairing." This event combines two of my favorite things (books & fragrances if you're visiting Nosy Girl for the first time today) and makes me want to reread passages from Your Voice in My Head with Katie-curated fragrance strips in hand. I hope this reading inspires loads more events like it (and I also hope Boston gets a store half as fantastic as the Scent Bar seems. 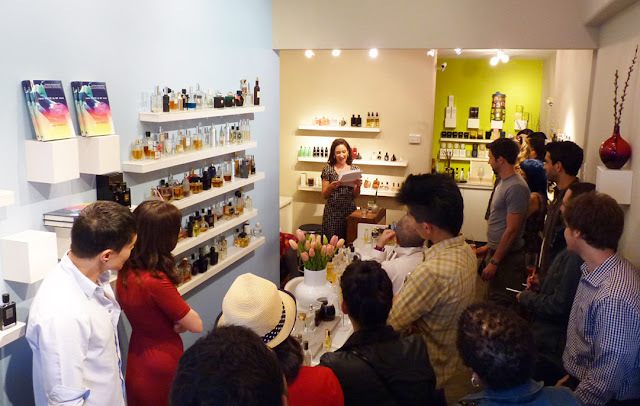 Its owners should open a little inn above the shop for scent-nerds like me who would like to travel to LA and spend every minute of their non-taco-eating time at the Scent Bar).